Broadway In Chicago has announced that a digital lottery will begin October 1 at 9 a.m. for Roald Dahl's CHARLIE AND THE CHOCOLATE FACTORY. 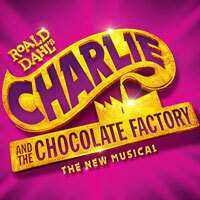 Roald Dahl's CHARLIE AND THE CHOCOLATE FACTORY will play a limited engagement at Broadway In Chicago's Oriental Theatre (24 West Randolph Street, Chicago, IL) from October 2 - October 21. Twenty tickets will be sold for every performance at $20 each. The lottery will happen online only the day before each performance. Seat locations vary per performance. - Follow the link "Click here for details and to enter the lottery"
- Click the "Enter Now" button for the performance you want to attend. - Fill out the entry form including the number of tickets you would like (1 or 2). Patrons will receive a confirmation email once they have validated their email (one time only) and successfully entered the lottery. - After the lottery closes, patrons will be notified via email within minutes as to whether they have won or not. - Winners have 60 minutes from the time the lottery closes to pay online with a credit card. - After payment has been received, patrons can pick up tickets at the Oriental Theatre (24 West Randolph Street, Chicago, IL) no sooner than 30 minutes before show time with a valid photo ID.